Jack Cody receives a notification for a new shift that has been assigned to him. Sandra reviews the details and is happy to approve the swap. She clicks on ‘Approve’. Jack and Lachlan receive a notification confirming the swap has been approved and the shift is automatically reassigned in the roster to Lachlan. Tracking shift swaps over periods of time using the Shift Swapping Report. 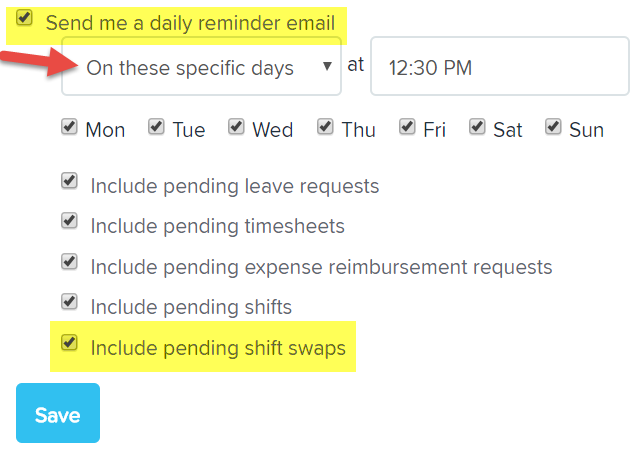 At a business level, you can set the cut off period where an employee can no longer swap a shift. If the setting prescribes that a shift can be swapped up to 48 hours before the shift commences, employees will be prevented from swapping a shift the day before the shift commences. No manager approval required at all: In this scenario, when an employee accepts a shift swap the shift will automatically be reassigned in the roster to the employee who accepted the swap. Manager approval only required where the swapped shift cost is higher than the original shift cost: In this scenario, the manager will be notified only when the shift cost, as a result of the swap, becomes higher than the original shift cost. If this is the case, the manager will need to approve the swap before it is confirmed. Otherwise, if the swapped shift cost is equal to or lower than the original shift cost, the shift will automatically be reassigned in the roster to the employee who accepted the swap. Swapped shifts always require manager approval: In this scenario, when an employee accepts a shift swap the shift will need to be approved by the manager before it is reassigned in the roster to the employee who accepted the swap. Both employees will then be notified and the shift will remain assigned in the roster to the original employee.